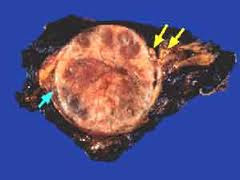 Pheochromocytoma, Adrenal Tumor, Symptoms, diagnosis and Treatment. Adrenal gland has two main layers, cortex and medulla, the cortex is further subdivided into 3 zones and every zone secretes a specific set of hormones. The adrenal medulla secretes epinephrine and norepinephrine. In normal conditions, adrenal medulla secretes catecholamines after the stimulation of sympathetic nervous system. Hence sympathetic overactivity or adrenal medulla tumour will result in increased secretion of catecholamines. These excessive catecholamines result in symptoms of pheochromocytoma. 4. GIT ( Gastrointestinal tract): Nausea and vomiting. 5. Skin: Pale, cool, moist, increase sweating. There is increase urinary secretion of, catecholamines, conjugates of catecholamines and VMA that is vanillyl mandelic acid. High concentration of this chemical will strongly suggest Pheochromocytoma. Moreover, CT scan and ultrasonography or MRI show an abnormally enlarged adrenal gland at the superior pole of the kidney. 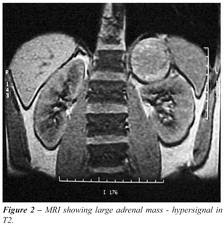 MRI showing a large adrenal mass on the left side. Surgical Removal of a tumour.